They are the third molars and the last teeth to erupt in the back of the mouth. This usually occurs in late teens ('the age of wisdom'). Most people have two in the upper jaw (Maxilla) and two in the lower jaw (Mandible). Why am I having my wisdom tooth/teeth removed? Surgical removal can be required for several reasons. Often, wisdom teeth are stuck ('impacted') against the adjacent tooth or within the jawbone and are not able to come through fully into the mouth. A partially erupted wisdom tooth may be difficult to keep clean. This can then cause chronic infection and discomfort in the surrounding gum tissue. Such infections may require treatment with antibiotics. A wisdom tooth can also become decayed or cause decay to adjacent teeth. Your dentist may not be able to treat this decay until the wisdom tooth has been removed. In Line with NICE guidelines (National Institute of Clinical Excellence), wisdom teeth should only be removed if they are causing problems. We will discuss this with you during your appointment. How will it be removed? This depends on the position of your tooth and degree of impaction as well as the way it is impacted. Some can be quite straightforward to remove. More commonly, simple extraction is not possible and surgery is necessary to remove it. The type of the surgery needed depends on the position of the wisdom tooth. This may influence whether your operation is carried out under local anaesthesia alone or with additional intravenous sedation. All options can be discussed with you during a consultation appointment. This again depends on the position of your tooth, and whether the operation is being carried out with local anaesthesia alone or with additional intravenous sedation. 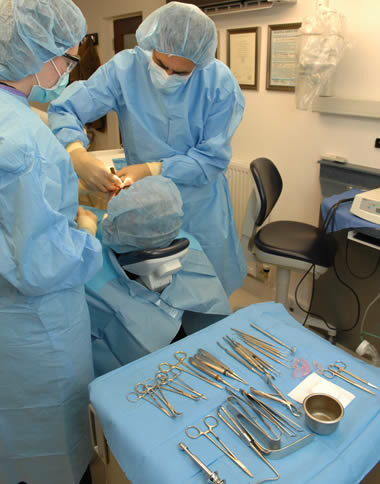 An appointment for surgery under local anaesthesia usually lasts 45 minutes. When intravenous sedation is used, an appointment usually lasts 90 minutes. The longer time allows for the recovery period needed before you can be discharged home. Sometimes stitches are needed and they are usually dissolvable. An appointment will be arranged for this, usually one week after surgery. There may be swelling and bruising in the area of surgery as well as some discomfort which might limit jaw opening. Bruising is usually at its most obvious two to three days after surgery and varies between patients. It normally resolves itself after 10 to 14 days. Occasionally, an impacted lower wisdom tooth can be very close to nerves supplying the lower teeth, lip, chin, cheek and tongue. These can get bruised when the tooth is removed, resulting in the sensation of numbness or tingling in these areas. This change in sensation only affects 2-5% of patients and is usually temporary. It can take up to six months to fully resolve itself. It only very rarely becomes permanent. If this is a factor for you to be aware of, due to the proximity of your wisdom tooth to the nerves, we will discuss it with you during your appointment. This depends on your occupation and how you are after your treatment. It may be possible to return to work the next day. Some people need to take some time off work, especially if the operation has been carried out under intravenous sedation. We will give you appropriate advice for your particular circumstances.